Sweet Virginia is one of those films which allows its plot to slowly unfold, allowing you to examine the various characters, then revealing how they interact, both directly and indirectly. At the film's centre are two men and two women, and a supposed robbery that goes wrong and leaves three people dead. The women, Lila and Bernadette, were married to two of the men killed. We know, because we watched the event unfold, that Elwood is the killer, an assassin for hire who happens to be staying at Sam's motel while he waits for his money. Elwood and Sam strike up an easy going friendship which seems genuine. Although well-liked, you get the impression that Sam doesn't get to hang out and chat with many guys, his main contacts being Lila, who works for him, and Bernadette, with whom he was having an affair. Elwood is a piece of work though. He has a habit of picking fights and exploding into violence. An encounter at an off-road payphone is a prime example. He's prone to over-kill, as we see during the robbery. However his friendship with Sam seems to be genuine, and he shows his vulnerable side when he tries to speak to his mother on the phone. This is definitely a slow burn movie. It is as much concerned with the relationships between its characters as it is the thriller element (the scene on the bridge is superb though when you suddenly find out the reason for the robbery and how it colours certain characters). There are moments of violence and they do make a striking interjection into the story. The various secrets certain characters hold also provides a lot of tension and there are times when you cannot predict what is likely to happen. 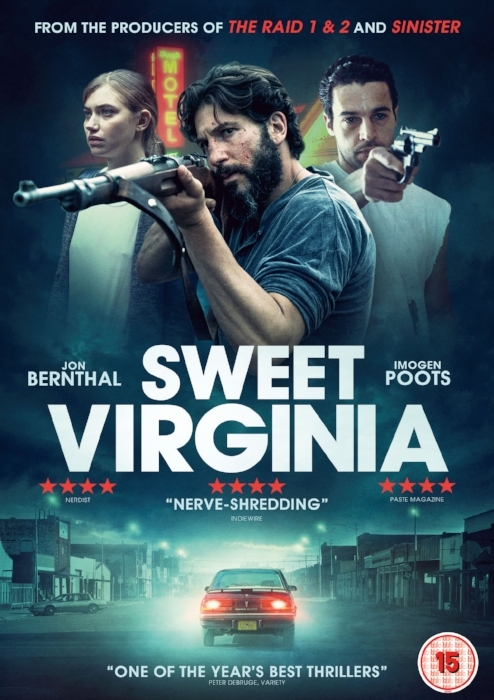 Sweet Virginia (the title is a holdover from an earlier version of the script, which was set in the South, rather than the North) is a very well shot and directed film. It marks the second outing for director Jamie M Dagg, who previously impressed with his debut film, River. The leads are all great, there are some very likeable characters, and the low key story is very compelling. However, do not expect hi octane thrills or a rapid pace.